To Tune into Whisperings Radio from an Android phone or tablet, just return to our Home Page, and click the blue play/login button for the player you want... the free player or the commercial-free PureStream player (for paid subscribers). In either case, our player will detect that you are on a mobile device and automatically redirect you to our HTML-based mobile device player to tune in. PureStream subscribers: While our default mobile device player works great for straight-up commercial-free streaming, if you would like more features than what the basic player offers (such as the customization features), we recommend the third-party Whisperings app (below) which makes those advanced features accessible from your device. The Whisperings App is made, sold and supported by a third party, a company called Emphatek for $9.99 USD. 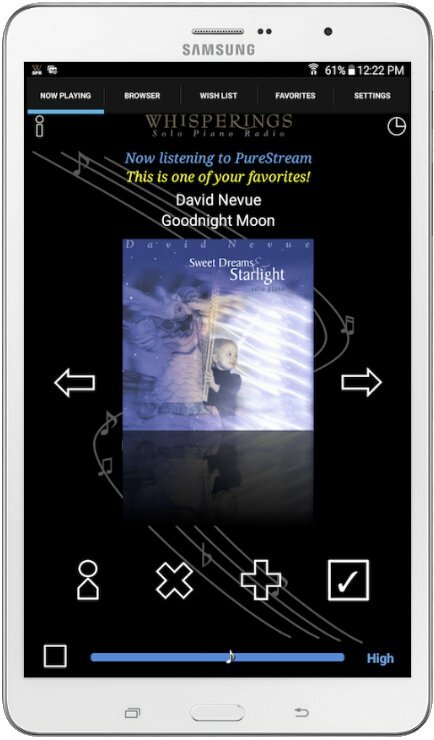 Once you purchase the app, you can download it on any Android device from the Google Play Store account and access (from the app Settings tab) either the Whisperings Free Stream (the default), commercial-free PureStream (if you have a paid subscription) or the PureStream Custom option, which gives you access to features like skipping songs, marking favorite songs/artists so they play more often and so on. Please note the Whisperings app does not include a paid subscription to Whisperings PureStream. A PureStream subscription is $30/year. Read more about PureStream here. The Whisperings Android app was custom designed to access Whisperings radio over any 4G, EDGE or WiFi network. Get the application right here from the Google Play store for $9.99. Incredible, fast, one on one customer support for the app... direct from the app developer. A Beautifully designed interface that displays the album art, song and artist info. Customizable player for Whisperings PureStream subscribers (sold separately) that allows you to mark favorites so they play more often, skip songs, and remove songs you don't want to hear again. One-click login for PureStream subscribers. Post "Likes" to Twitter and Facebook. Leave comments about a song so other listeners can read your opinion. Visit Amazon.com to purchase and download the current song or add song info to "wish list" to look up later while you continue listening. Built-in browser to visit Whisperings' artist web sites, subscribe to Whisperings PureStream and/or peruse other sites without exiting the app. Play music in the background while running other apps. Responds to many popular docking station remote controls as well as controls on headphones. Add song to "Wish List" feature flag songs you love for purchase later. Configurable sleep timer that will gradually fade the music volume and shut down the app. Configurable wake timer that will start the music and slowly fade up the volume. Settings to control stream quality and reduce buffering on congested networks. Stops music when you receive a call and restarts when the call is complete. Questions? For technical support or other questions about this app, please contact the app developer, Ken Roy at kenroy@emphatek.com.